The massive earthworks of Painscastle dominate the valley of the Bach Howey in the old Welsh commote of Elfael Is Mynydd, which was reckoned in the thirteenth century to be just one day’s march from Hereford. In 1093 the Norman Marcher barons launched a concerted attack upon Wales after the death of King Rhys ap Tewdwr of Deheubarth. During this assault Ralph Tosny of Clifford castle annexed the neighbouring cantref of Elfael, probably building a castle at Glan Edw in Elfael Uwch Myndd. It is possible that Ralph commenced the fortification of Painscastle, but there is no conclusive proof. Painscastle is named after a man of the next generation and it is quite possible that the castle was not commenced for another thirty years. During the reign of King Henry I, Pain Fitz John was granted great estates in the Marches of Wales. After the death of Hugh Lacy before 1114 he was granted the castles and honours of Ewias Lacy or Longtown as it was later to be known, Weobley and Ludlow. He was also sheriff of Herefordshire and Shropshire which gave him the castles of Hereford, Shrewsbury and Bridgnorth. In 1117 and 1127 Ralph Mortimer of Wigmore rebelled against Henry I in favour of his son-in-law, Stephen of Aumale and on one of these occasions Henry I gave Wigmore and associated castles to Pain. Finally on the rebellion of Ralph Tosny Pain would seem to have acquired Clifford and Elfael and so before his death at the hands of a Welsh raiding party in July 1137 he found himself in a position to build the castle which still bears his name. With Pain’s death the commote of Elfael Is Mynydd reverted to Welsh rule if it had not done so already. The castle site would appear to have then passed through the control of princes Madog ab Idnerth (d.1140), Einion Clud (d.1177), Cadwallon ap Madog (d.1179) and Owain o’r Porth (d.1191). There was then a further disputed succession between the brothers Gwallter Fychan and Iorwerth Clud. After four years to fighting the Lady Matilda St Valery, wife of William Braose (d.1211) of Radnor and Brecon, advanced on Painscastle where she ‘slaughtered the Welsh’. She then proceeded to refortify Painscastle much to the annoyance of Prince Rhys ap Gruffydd of Deheubarth. In 1196 Rhys struck back on behalf of his relatives of Elfael and defeated the Marchers at the battle of Radnor before besieging Painscastle and returning it to his seizin, although he failed to actually take the castle. Rhys died the next year, but Prince Gwenwynwyn of Powys reopened the issue in 1198 and in July besieged Painscastle, without siege engines. He brought with him most of the princes of Wales, and many of them fell in subsequent disastrous battle of Painscastle when the justiciar, Geoffrey Fitz Peter, routed Gwenwynwyn in August. In 1208 William Braose fled Wales during his dispute with King John and Painscastle would appear to have been occupied by Iorwerth Clud with King John’s sanction. In 1215 William Broase’s sons returned and Gwallter Fychan was empowered to take Painscastle for himself, which he soon did. Gwallter was succeeded by his son, Roger Fychan, soon after 1223. In 1231 King Henry III and Hubert Burgh came to Painscastle and elegantly rebuilt the wooden portions of the fortress in stone and mortar naming the castle Maugre Llywelyn, the bad neighbour of Prince Llywelyn of Gwynedd. In 1233 the castle was claimed back from the king by Ralph Tosny (d.1239) as ‘his ancient right’. Painscastle and its associated commote of Elfael Is Mynydd became a rich pastoral barony for the Tosnys, but in 1265 the fortress was sacked by Prince Llywelyn ap Gruffydd during the Evesham campaign. Llywelyn then held the district until 1276 when Ralph Tosny (d.1295) re-conquered his father’s lands. Painscastle was last fortified in 1403 against Owain Glyndwr after which it was gradually allowed to fall into ruin. Today all that remains of this great fortress are massive earthworks. These consist of a great motte which was once crowned by a keep. Beneath this is a rectangular bailey all of which is still deeply ditched. The remains of two barbicans can still be made out that approached the entrances to motte and bailey. The earthworks suggest at least two round towers stood in the bailey enceinte as well as a hall block. The outer earthworks have cavaliers in them which are similar to those found at Berkhamsted castle. Order Painscastle, 1066 to 1405 for £9.95 through the PayPal basket below. 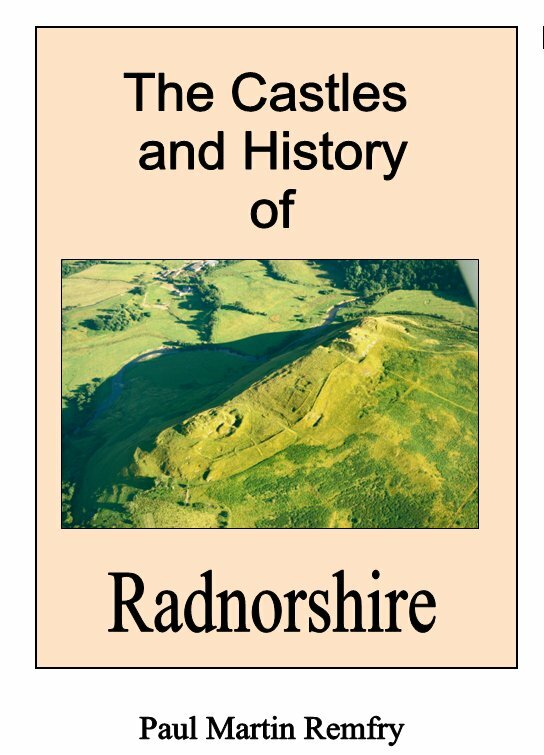 The Castles and History of Radnorshire (ISBN 1-899376-82-8) looks in great detail at Painscastle and the surounding land of Elfael. It also explores the possibility that the fortress may have been built as early as the 1090's. This book consists of 309 pages of A4 and examines in greater detail the history and castles of Radnorshire and Rhwng Gwy a Hafren. Starting in the early eleventh century the book covers the age of the castles up to the Civil War of 1642-46. Each castle description is buttressed by numerous photographs and plans of the earthworks and remains where they survive. A new look is also taken at the battlefield of Pilleth and the evidence for the course of the battle is scrutinised. The book also contains genealogical family trees of the major historical Radnorshire families and a full index.